I’m stuck at my office, sitting at a desk and thinking about how much I wish I could just have a week to sleep late and work on quilts. In the massive amount of time since my last post, all I have accomplished is creating the binding for my prior year Valentine quilt. I really wanted to get it done by Saturday. I came across the latest shortcut quilt pattern from the ladies at Fat Quarter Shop and I think I could put this one together in a weekend! They have a blog post and online YouTube video tutorial about this quickie. The pattern is free or you can also get the kit with the adorable Mistletoe Lane by Bunny Hill Designs. Click here to open a window to their blog post. I also splurged on four quilt magazines this week too. I hadn’t bought any magazines in awhile and let my subscriptions run out. I saw a couple of other options for an easy layer cake quilt, so it will be fun to decide. My eBay activity is ramping up too. I just received two charm packs of Aloha Girl! – the newest collection coming out in March for Fig Tree Quilts. I have a fat quarter bundle that will arrive by Friday. I don’t know where these people get the early releases, but I love to get my hands on them. Hope you are finding time to quilt this week! I can’t think of a witty title for today. It is now Sunday evening, and I’m about to prepare dinner. I have done a little sewing, specifically on my Great Granny Squared quilt. The friend whom I intend to be the recipient of this house warming quilt just closed on her home a couple of days ago. I hope to get this one done in the next month to be timely in the delivery to her. I have 11 blocks left to make. And even though I didn’t find my Birds & Berries fabric, I did come back across a box that had 4 charm packs of Wee Play by Sandy Klop (American Jane). I really, really want to make something with her collections. I also have some precuts of Potluck that is more recent. I had purchased 4 yards of the Moda Weave Black to possibly go along with it (inspired by a quilt done by Ms Cupcakes ‘n Daisies. She named it “I’ll Take Mine Black“). I have also decided on a quilt to make for my upcoming grand-daughter. Well, step grand-daughter. I really struggle to think of myself as a grandmother yet since I have a 5 and 7 year old at home. Denial, denial, denial. I’m in my early 40s, so it isn’t impossible .. but… denial, denial, denial. 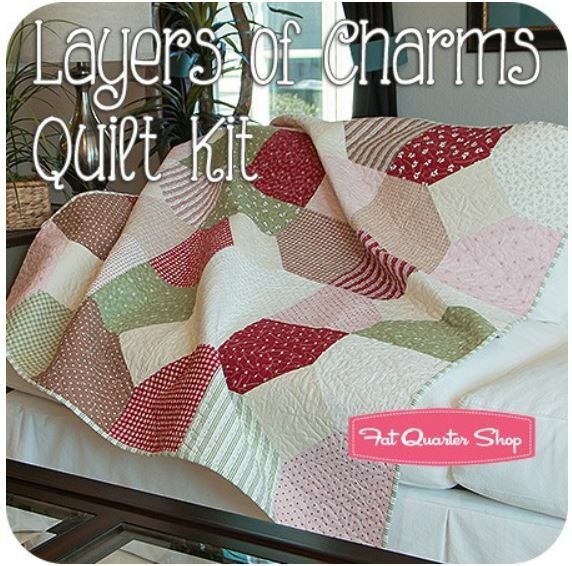 Sunbeams Quilt Kit offered by Fat Quarter Shop… fabrics in Mirabelle collection by Fig Tree Quilts. The mommy-to-be said she was doing her room in yellow, so this felt really perfect. I hope it goes together fast though – she’s due in June! I hope you had a great weekend and was able to enjoy some sunshine today. We are feeling the spring weather finally coming around. Next time – the next block in Reach for the Stars!! Another Clover? Am I crazy?? First up, is my completed Block 5 for Reach for the Stars. It went together great. I ignored the directions for the most part and made my HSTs with 2 1/2″ squares sewn together on both sides of the diagonal, trimmed down to be 2″ unfinished HSTs. Not much waste at all. The large, focus HSTs (four of them) – I still cut as directed because of the fussy cutting and I wanted as much of the floral motif to be in the block as possible. I changed up the fabric choice a little in the center. It was originally all the same light background. I brought my block to work today, so I could take a picture on our conference table and do my post during the lunch break. Black print is from American Gothic, the light background is from Little Black Dress II (ordered me some more of that one! ), floral is from the Palm Court panel (really looking like swiss cheese now! ), and the center swirly black/white is from Downton Abbey. I didn’t have enough of the sashing fabric, so I’ll have to add it later this week when it comes in. Black with the same floral motif as the panel and a hint of gold metallic tones. I have a fat quarter of this one already, so I know it will go just perfectly. Look at what else I got in the mail yesterday! Lori Holt’s new booklet!! She is showcasing her upcoming collection called “Vintage Happy” and I am definitely going to make the feature quilt in it. 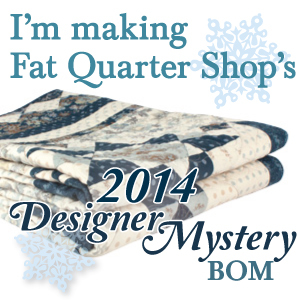 Fat Quarter Shop is kitting the quilt, and they say you will have enough leftover to “start” the bonus quilt also (the one with the dark navy background on the cover photo above). 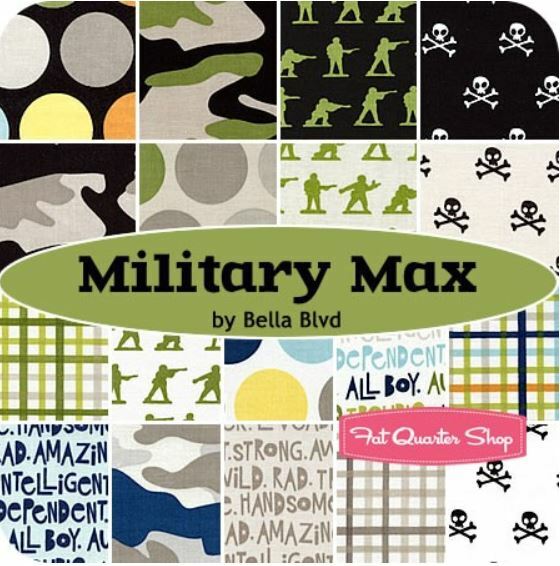 I think this fabric will play nicely with my other Lori Holt hoard of fabrics, and even with Happy Go Lucky or Avalon (which I may have a few bits of as well). Did anyone else pre-order the book – or also planning on getting this? You may recall my participation in the AYOS sew along this year, where we did the CLOVER pattern by Miss Rosie’s Quilt Company. It is also based on an album block. The difference here is that Lori has you square off each block in her method, and add sashing, etc… She also adds another round of squares. 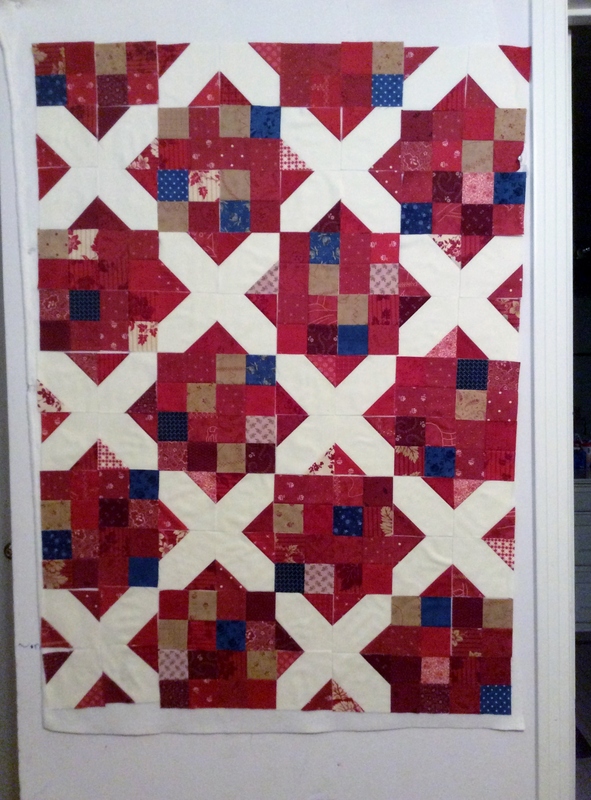 I struggled a lot with Clover because of the long diagonal row piecing you had to do. However, I loved the result! Well, back to work work work work work. I hate how it interferes with my play time!